BOONE, N.C. — The subject at a recent Appalachian State football practice this week turned to weather forecasts and coach Scott Satterfield was quick to remember one of the most challenging of his Mountaineer playing career. Playing in his first I-AA playoff game on that cold, windy afternoon at ancient Cowell Stadium, Satterfield and his teammates ultimately survived for a 17-10 win in one of the shortest overtime contests in NCAA history without having to throw a pass. On the first snap of overtime, fullback Adwin Lance broke through the UNH line on a simple stretch play and raced untouched for 25 yards and a touchdown. Following kicker Jay Sutton’s extra point, All-American linebacker Dexter Coakley forced a fumble with a shattering hit on a running back who hadn’t fumbled all season. Defensive end Chip Miller recovered the loose ball and the Mountaineers exited New England weary and chilled to the bone with a date to play Boise State on its blue turf the following week in the NCAA quarterfinals. Watching from the open-air press box at the top of the catacombed-like structure, this writer was trying to figure out how to write his game story on a DOS-based, 286-speed laptop computer with keys that had frozen during the chilly onslaught. Conditions are not expected to be that challenging on Saturday when Appalachian State (4-2 overall, 2-0 in the Sun Belt Conference) hosts Idaho (4-3, 2-1) at 3:30 p.m. on homecoming day in Kidd Brewer Stadium, but with the potential of 30-mile-per-hour winds, current App State quarterback Taylor Lamb and Idaho’s Matt Linehan will have to make some adjustments. Fortunately on days like what is expected on Saturday, the Mountaineers have that ground game to fall back on. Though Appalachian has suffered through its share of minor injuries in recent weeks, the Mountaineers’ depth has helped it to not only survive, but thrive. Sophomore tailback Jalin Moore has rushed 81 times for 512 yards and five touchdowns with senior star Marcus Cox out of the lineup and Moore can look forward to facing an Idaho defense that he scorched for 244 yards on 27 carries last year during ASU’s 47-20 road win. Cox is expected to return for the first time since he suffered a left quad injury against Miami in the third week of the season. When Lamb needs to, or chooses to throw, he will have the added confidence from the Mountaineers’ 24-0 victory against Louisiana-Lafayette to build from. Lamb opened last week’s nationally-televised game with eight consecutive completions and finished 15-of-26 for 201 yards and two TDs passing. Six of those completions were to his favorite target Shaedon Meadors, who had career highs for catches and yardage (128 yards), including a 56-yard connection on App State’s first offensive play. Lamb also benefitted from the play of freshman tight end Collin Reed, who made four key catches for 27 yards, including one touchdown as he started in place of the injured Barrett Burns. Burns is expected to return on Saturday, which will give Appalachian another threat against the Vandal defense. Should the wind be a factor, it will probably impact Linehan and Idaho more than ASU. Linehan, whose father Scott is one on a great list of Vandal quarterback stars and was the head coach of the NFL’s St. Louis Rams in 2007, is arguably the Sun Belt’s best passer. The strong-armed quarterback threw for 476 yards and five touchdowns in a 55-23 rout of New Mexico State last Saturday. Linehan has over 7,000 yards passing in two-and-a-half years as the Vandal starter and is averaging 227 yards-per-game this season. “Anytime you score 55 points in a game, your offense is playing pretty good,” said Satterfield. ASU has hammered Idaho 45-28 and 47-20 in the past two years, but Satterfield said he doesn’t expect things to come so easily on Saturday. Idaho’s defense may be improved, but it is still giving up nearly 36 points per game and ranks 112th nationally in yards allowed (473). One weapon for the Vandals is kicking specialist Austin Rehkow, who is averaging 43.7 yards per punt and is 14-of-16 on field goals this season. The strong-legged kicker is considered to be an NFL prospect as a senior. Idaho will face an App State defensive unit that has rounded into shape after some uneven results in the non-conference season. The Mountaineers have allowed just three points in their first two Sun Belt games to move to 19th in the Football Bowl Subdivision in points-allowed-per-game (18.8) and 42nd in total defense (364.7 yards). 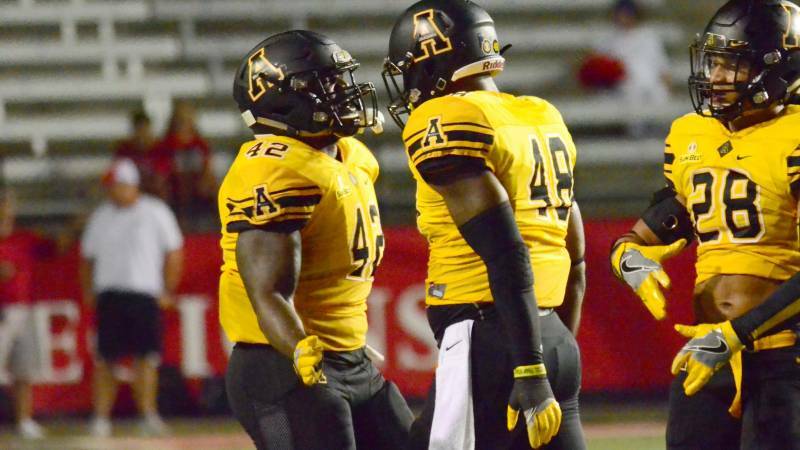 Defensive end Dezmin Reed was involved in three of Appalachian’s six sacks last week and the talented young secondary has helped the Mountaineers grab nine interceptions and make 17 pass breakups. In Sun Belt play, the ASU defense has allowed opposing teams to get into the red zone just once. “Once they get to the red zone, we don’t expect them to score anyway,” said confident cornerback Mondo Williams, who leads the team with three interceptions also has three pass breakups.